Hot Water Sydney - Emergency hot water repairs & HWS installation. › Fast, same day hot water repairs Sydney. › Hot water system replacement & installation service. › Take advantage of our buying power and save on the purchase of your new hot water heater. Servicing all Sydney suburbs & the Central Coast. We'll beat any genuine quote today!  All your gas, electric and solar hot water repair and installation requirements in one place. 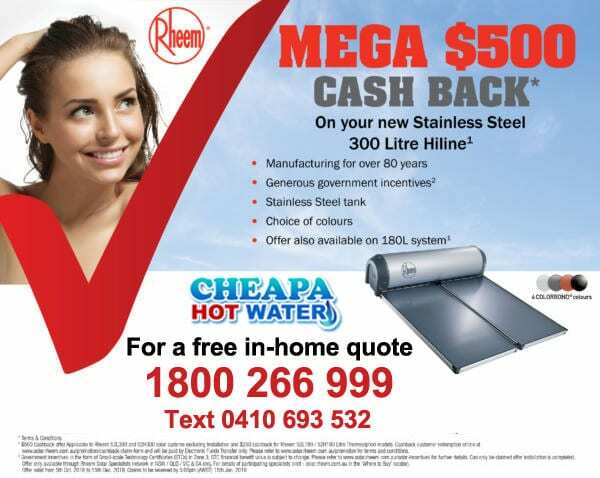 We are Sydney’s leading hot water plumbers. Our fully stocked trucks are on the road right now with thousands of hot water heater spare parts fix any problem you may be having – TODAY! 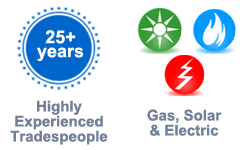 We have been fixing and repairing gas, electric and solar hot water systems for 20+ years. Our same day hot water repair service means our customers never suffer the indignity of cold showers! Did you know your hot water heater should be serviced every 5 years? 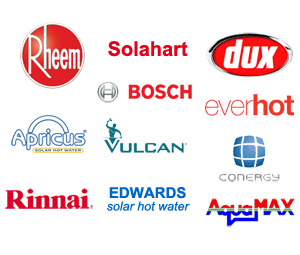 We are authorised service agents for all major hot water heater brands including Rheem hot water, Dux, Rinnai, Aquamax, Bosch, Conergy, Hocking, Apricus, Vulcan, Edwards Solar, Solahart, Everhot and more. Your HWS is an expensive appliance – don’t risk voiding your warranty. Get trouble-free hot water usage and prolong the life of your HWS. Constantly running out of hot water? Energy bills too high? Want to be more environmentally friendly? Contact us for advice on what HWS will best suit your household hot water usage requirements yet stay within your budget. Our advice is free and could save you thousands! We’ll even beat any genuine quote plus take away and recycle your old hot water heater! No hot water? Leaking hot water heater? Our trucks are on the road right now carrying thousands of spare parts to attend to your hot water repair today. Running out of hot water? High hot water bills? Hot water heaters are expensive so call us for advice on the right hot water system for your home. WE SELL HOT WATER HEATERS! Take advantage of our enormous buying power and get the cheapest prices for new hot water heaters. Free, same day delivery. Your hot water problems resolved today! 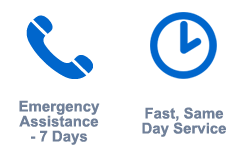 Our highly experienced, licensed hot water installers are on the road right now ensure that your hot water heater problems are resolved quickly and efficiently – TODAY! We service all Sydney suburbs and the Central Coast. 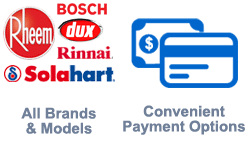 We service all hot water heater brands and carry thousands of spare parts to ensure your hot water system is repaired quickly and you don’t have to wait weeks for parts to be ordered and arrived. 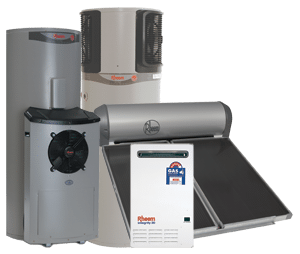 If your existing hot water heater is beyond repair, we can replace it by installing a new hot water tank today that suits your household consumption so you never run out of hot water again. The installation and repair of a hot water system often require the experience and qualifications of both a licensed plumber AND a licensed electrician. 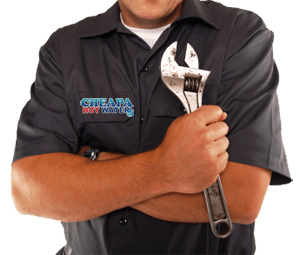 At Cheapa Hot Water Sydney, we are licensed and qualified to undertake any plumbing and electrical work required to complete the installation or repair of your hot water system quickly, and within budget. Plumbers who do not specialise in the installation of hot water heaters may need to outsource the electrical work required to another tradesperson, thereby holding up the installation or repair of your hot water system and also adding extra expense due to additional call out fees charged by employing two tradespeople. 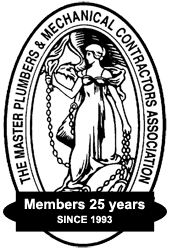 All work is carried out by our trained and qualified hot water service tradesmen – we DO NOT employ sub-contractors or outsource work to unskilled workers. Your hot water system is a very expensive appliance so why would you risk using a repairer who may not be qualified and experienced in hot water repairs and installation? Emergency hot water repairs & water heater installation service. Gas, electric, solar & instantaneous hot water systems Sydney. No hot water in Winter or after frosty or cold weather? My hot water heater is making weird noises!? !